Where are people when they write their blog posts? Or, rather, where are people when they just write? I find myself asking this question whenever I read something—blog post, short story, whatever. I’m fascinated by the sights (window? willow tree? big-screen TV?) and the sounds (night crickets? humming refrigerator? upstairs neighbors’ paces? meowing kitty?) that surround human and computer screen and that either inspire thoughts or compete for attention. And when? When do people write? Certainly time of day must control the above factors. What programs do they use? Do they type out their thoughts in Word, or in notepad to escape formatting, and then paste the spilled words into a post. Or, do they simply craft sentences right into the text field of their blogging platform? And do these things ever change, or are they constants? Is it socially acceptable to, in the comments field, ask: “Where were you when you wrote this post, and what surrounded you? I’m just curious.”? Me, I prefer to write at the kitchen table, which is surrounded by three windows, and the room is filled with light until sundown. I start in word. I need a very blank space, because my mind is usually busy. The wordpress dashboard is too busy. I prefer to be accompanied by breakfast or lunch, because I like to break up the flow with stabs of fork and slow chewing. In that time, I can recollect my thoughts, and what better way to write about food than with food? The eating reminds me of the textures and flavors of the dish. It doesn’t have to be that particular dish (though that helps!) and it also doesn’t have to be glamorous. Right now, I’m eating a clean-out-the-fridge-of-the-almost-on-its-way-out-produce salad. There are multiseed crackers on the side and some prunes. But when the apartment is bustling, I take the laptop to my bedroom, sans food. Writing is less fun that way—I should see if the tone of posts written in various locations is different. I often make my final edits while sitting in my bed with all of the lights off. It’s the purest form of silence and tranquility I can find. What’s important here, is that coming to this space, and chronicling this nonsense, forces me to sit and, often times, to eat. I’ve never thought about that or appreciated it until recently, for in my non-working hours, I have not sat in quite some time. Only when here with you. In fact, with the exception of a couple of on-the-go meals, I’ve eaten breakfast and dinner standing up on most days all summer. I’ve been busy, but not in that, “look at me and my crazy life I never sit down and I’m so stressed so feel bad for me” way. It’s much more mundane. On weekdays I eat breakfast while putting away the now-dry dishes from the rack from the previous evening. I eat dinner while doing the day’s dishes and packing lunch and snacks for myself for the next day. I’ll have a snack while organizing the house. And I hate that. I’ve always hated standing and eating at a window-facing counter at a deli or taco joint, so I especially hate doing it in my own home—a supposed place of respite. I need to sit, savor, and perhaps most importantly, digest properly. It’s dinner time now. It’s another thrown-together meal after a weekend of batch cooking for the week. These thin, folded, tender herby omelettes are a simple favorite I often return to, the fillings and flavorings reflecting what I have. This time, parsley-flecked eggs are spread with a tahini-yogurt sauce and wrapped around potato slices and sautéed peppers and onions. Yogurt thins the tender crêpe-like omelettes rather than milk. There’s roasted eggplant and fruit on the side. I want to best describe the recipe I’m sharing with you today. The nourishing omelettes helps me think. “Be bold,” they urge, like the slightly brash flavor of the tahini sauce. OK, then. This crisp might be is the best crisp or crumble I have made or eaten, despite my affinity for nearly any apple crisp you put in front of me. How do I know? For starters, I may have eaten the entire missing portion from the above photo over a 30-minute period. I’ll start from the bottom up: I used a mix of Sugar Plums, Black Amber plums, Blue Free plums, and Italian Prune plums and raspberries. As you know from last week, I’m not yet willing to declare summer over simply because it is not, so this combination is a happy compromise. Raspberries are a summer treat, but they usually grow through September. The first three plum varieties are late summer varieties. But, the muscat-y prune plum—that’s a distinctly autumnal fruit. So I guess this dessert serves to bridge the gap. This particular mix of plums resulted in an intensely complex-flavored crisp with spicy notes, sweet notes, savory notes, pleasantly tart notes, and a strong berry background. 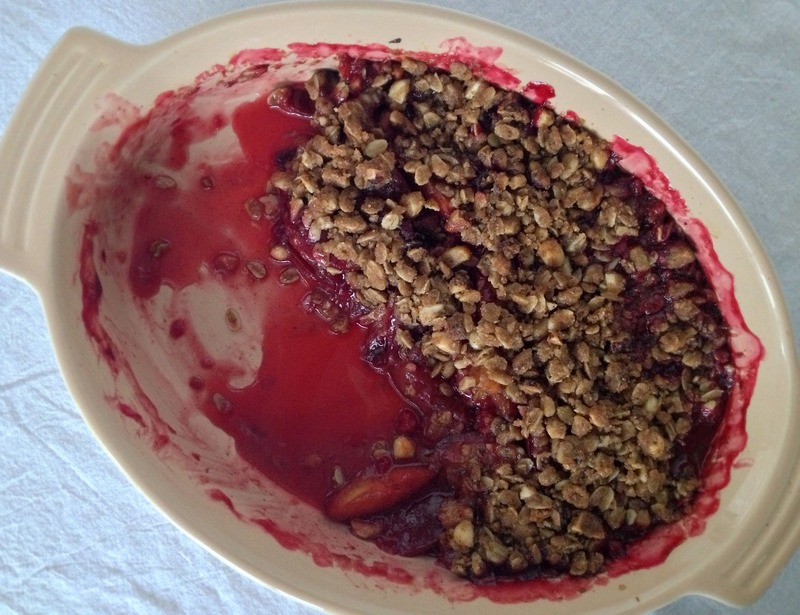 The flavors were intensified because I used a method I often use for fruit desserts: I macerated the plum slices and reduced their exuded juices on the stovetop and then added the pungent liquid back to the fruit. Plums and hazelnuts are a favorite combination of mine—the earthy, almost chocolaty flavors of hazelnuts heighten those of plums, so I wanted the two ingredients to join forces again. 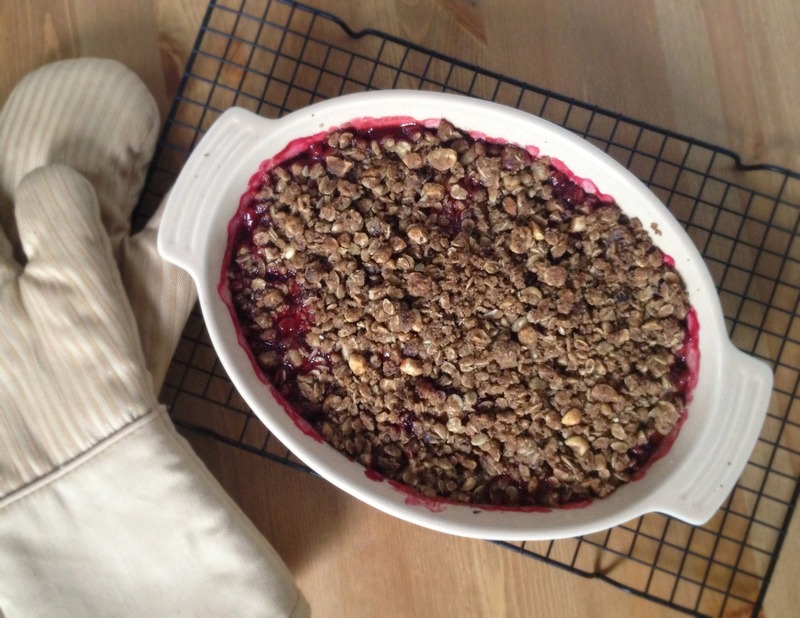 I wanted to highlight the hazelnut flavor, so I adapted my own recipe for a browned-butter crumb topping from this pie. I first tried cinnamon but found that a hint of allspice gave the topping a remarkably complex flavor. And for even more nuttiness, aside from the browned butter and the hazelnuts, I used spelt flour rather than all-purpose, and it worked beautifully. In fact, I may never make a crisp with AP again. Finally, I like my crisp toppings on the oat-y side so in adding oats to my previously oat-less recipe, I went with a bit more than most recipes calls for. The result? Super crisp, super deep, super nutty. The only problem is that I ate that big portion of crisp doing what I always do: standing up. I didn’t savor that first portion. I synthesized all of its flavors, judged it, retested it. But I did not sit down with it—have a conversation with it. It slid down my throat too quickly. My fork went from ice cream container to warm crisp, so I could have the two in my mouth at the prefect temperatures, cool ice cream melting into streams through warm fruit. I bent over it, eating off of a short table. And then I picked as I photographed. Out-of-place clump of topping? I’ll just scrape it off and eat it. Ice cream dripping down the sides of the dish? Nothing a wet tongue can’t fix. And before I knew it, it was gone. When I develop and make recipes, I need to start sitting. I resolve to start sitting—to enjoy the fruits of my labor to their fullest extent. I vow to relax. To live in the moment. To take a break. And just.sit.down. It’s now time for another dinner, and I’m finishing up this post. Dinner is a thrown-together meal on a busy night once again: roast Cornish game hen—the perfect bird for the for-one kitchen—zucchini, and cherry tomatoes slathered in za’atar, served with a Summer Three-Bean Salad I love from Flour, Too, minus a bean and the called-for radishes and plus thinly sliced quick pickles and goat cheese because why not? So make that “two-bean salad.” But I’m sitting down to eat it. Sitting down while eating dinner! What a concept! I taste creamy potato and cheese and acidic dressing and grassy herbs and wax beans and green beans and chicken and spice and fresh vegetables. I hear crunch, and squish, and slap. And it’s lovely. And my stomach is thankful. Thankful for the rest. Sources are all over the place in terms of pinning down a volume equivalents for spelt flour. I bake by weight and used 70 grams of spelt flour. I measured spelt flour three times (using the dip and scoop method) and found that 1/2 cup equaled 62 grams of spelt flour each time. This topping has salt in it but is not salty; the salt better complements the caramel flavor of apples. 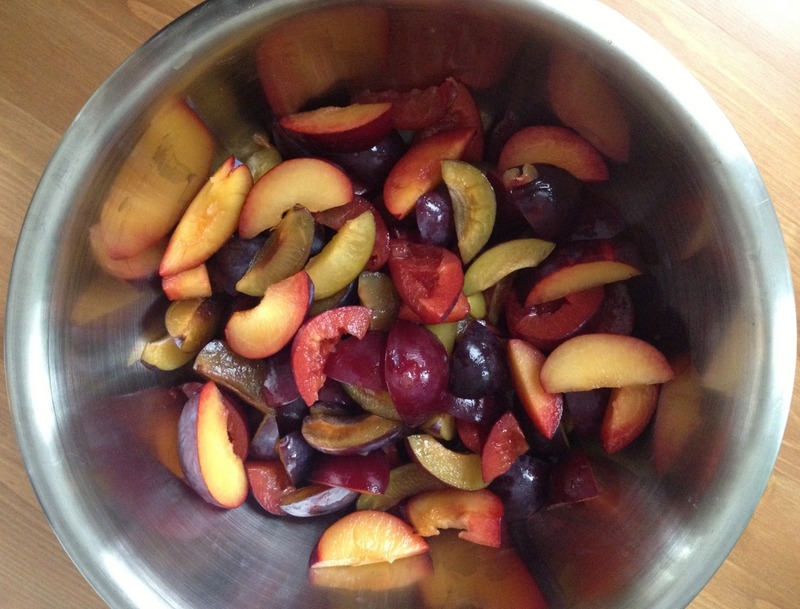 For the fruit: Toss plums with sugar in large bowl. Let stand for at least 30 minutes and up to 1 hour. 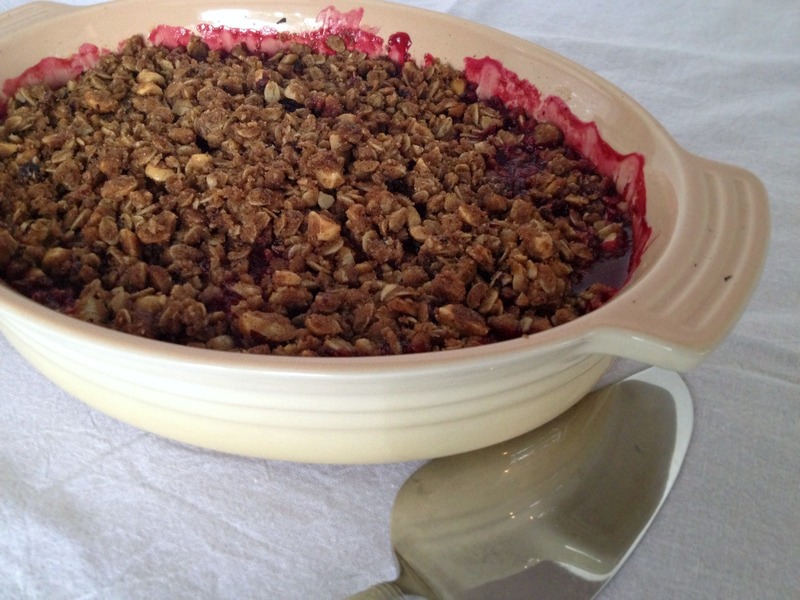 For the topping: While plums are macerating, melt butter in small, light-bottomed skillet over medium-low heat. Once melted, continue to cook, stirring occasionally with rubber spatula, until milk solids have turned dark brown, liquid has turned golden, and butter smells of toasted hazelnuts, about 10 minutes. (Stir constantly during last 3 minutes.) Pour browned butter into bowl and set aside until cool. 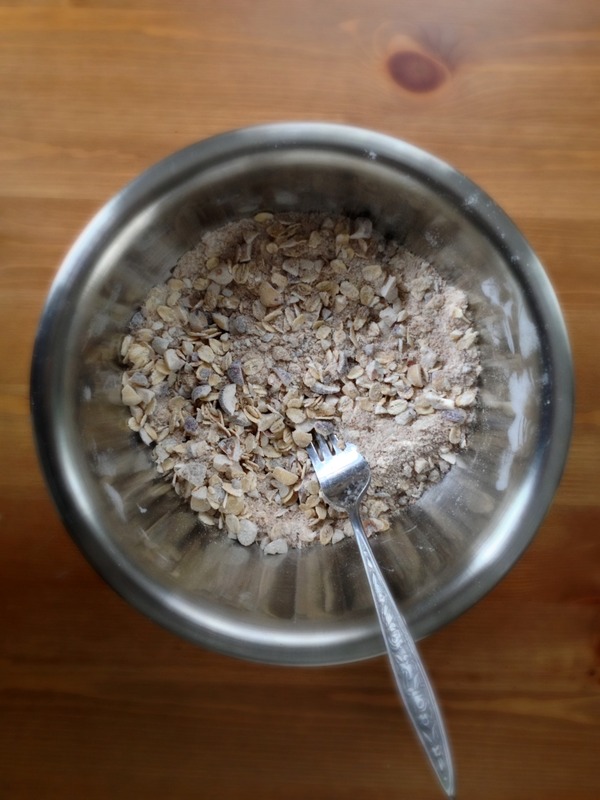 Using fork, stir hazelnuts, flour, oats, granulated sugar, allspice, and salt together in medium bowl until combined. Add dark brown sugar to bowl, breaking it up between you fingers; stir to combine. When butter is cool, pour over dry ingredients and use fork to mix until everything is dampened. Continue to mix, pressing clumps of moist ingredient together to create some clumps. Set aside skillet. Refrigerator topping until cold. Adjust oven rack to middle position and heat oven to 375 degrees. 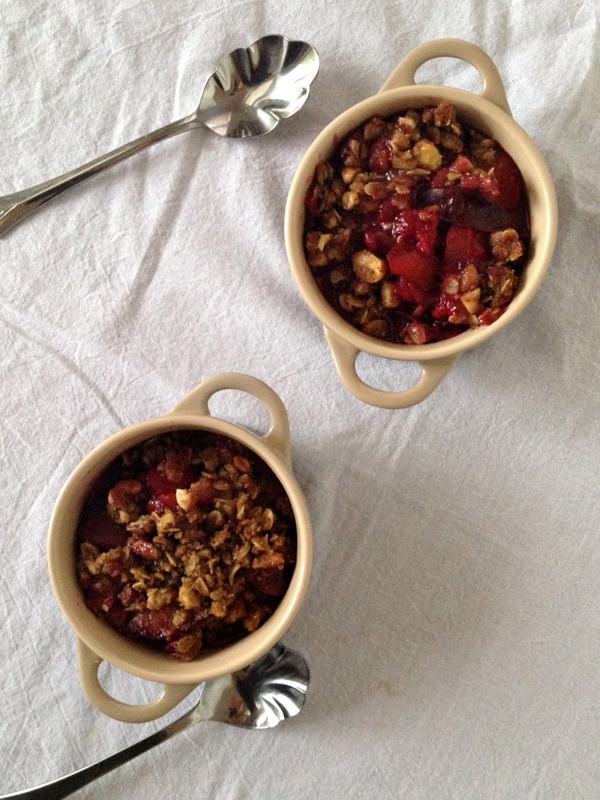 Drain plums into liquid measuring cup. (You should have about 1/2 or a bit more of juice.) Transfer juice to now-empty skillet and add butter. Simmer juice mixture over medium-high heat until it reduces to 1/4 cup (or 3 tablespoons if you prefer a less juicy crisp). I usually write in the afternoons (like, right now) but there have been many, many nights when inspiration hits and I have to just pour my thoughts out and save drafts on my computer. I also like writing without any distraction – no music, no food. I need to take breaks for those :) I’d like to take a break for this crisp! 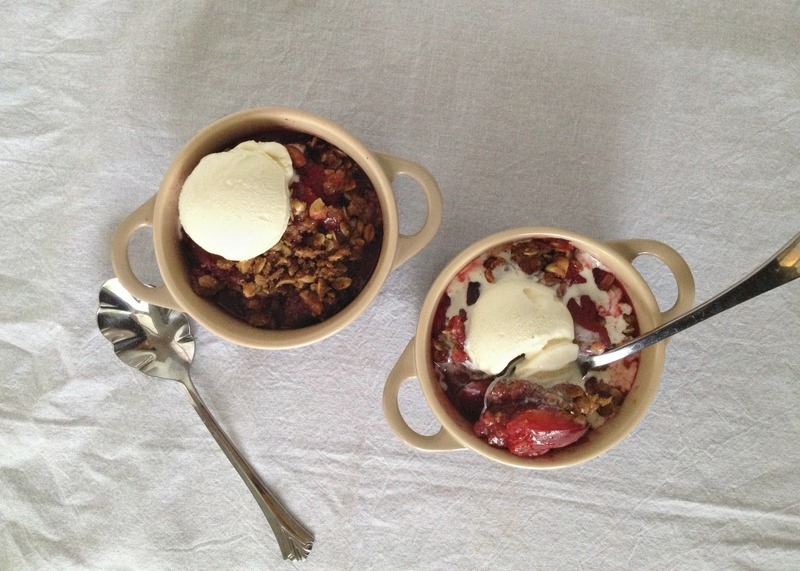 plums and hazelnuts- i must try this combination! and you have me craving crepe-like omelets now, too. what time is dinner? :) I have gotten out of the writing habit lately… need to make some time to get back into it!